It is now 11:43 pm and I just finished painting #3 for the 3rd day of the 30 Paintings in 30 Days challenge. I had a busy day and I had to work the painting around other things. This painting was all about using the "P" sound for my alliterative title. I had fun with the different textures of the fruit, pinecone and cloth. It all came together pretty quickly once I got to painting. Does anyone know which of my paintings is depicted in the background of this painting? 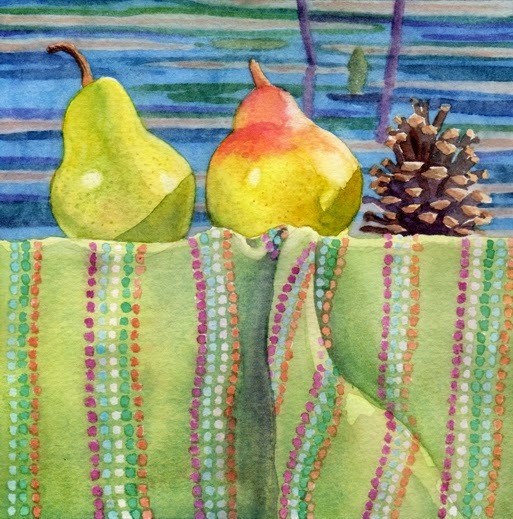 'Pears, Pinecone, Polka-dots, & Painting' is a 6" x 6" watercolor. It is available for purchase on Daily Paintworks for $150 (framed) - Click here to purchase.